Make sure you have all necessary screwdrivers before you start: Phillips #0, Torx T6, Try-wing and Pentalobe P5 (if you are fixing a MacBook Air). Remove the bottom cover, disconnect and remove the battery. The sooner you disconnect the battery after liquid spill, the better. If the battery is wet, wipe it clean with a soft cloth. Remove the hard drive and take a look at the controller board on the bottom side of the drive. If it is wet, wipe is clean and let it dry thoroughly before turning on. If laptop repair fails, later you can transfer data into new Mac. 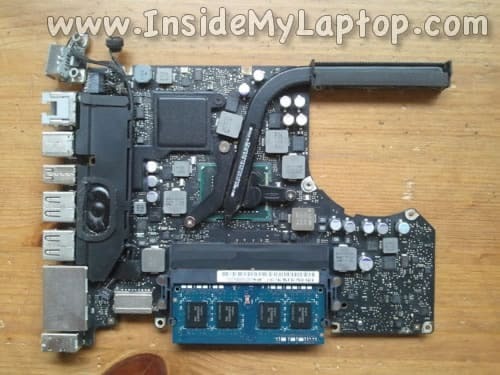 You will find many instructions on the Internet explaining how to remove the motherboard from MBPs. iFixit has some great teardown guides. After the motherboard is removed, insect all remaining internal components (DVD drive, trackpad, area under the motherboard, etc…). Clean up wet areas with a soft cloth. The keyboard and trackpad a sealed units. There is not much you can do to clean them up inside. Also, inspect the MagSafe Board (power connector board). Even a minor corrosion can affect the functionality of the computer. Clean up any liquid damage/corrosion using a toothbrush and isopropyl alcohol. If you spilled something sticky or sugar containing drink (milk, coffee, soda, liquor, etc…) you can use regular hot water to clean it up. 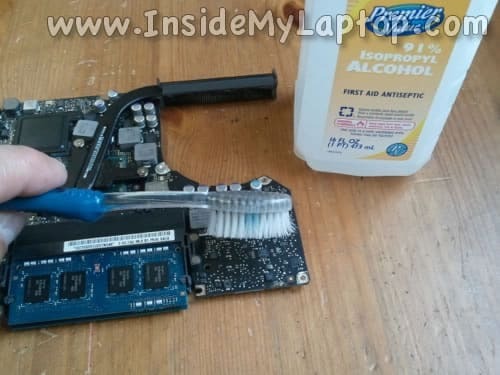 If you find wet areas on the motherboard, dry them out very carefully using a soft cloth (without rubbing the motherboard). After that clean these areas using a toothbrush and alcohol. 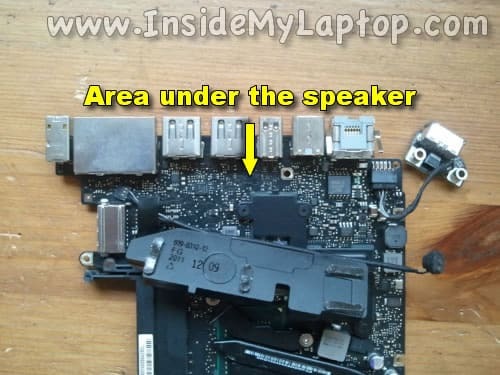 Inspect hidden areas on the motherboard, like an area under the speaker. If any liquid damage found, clean it up. 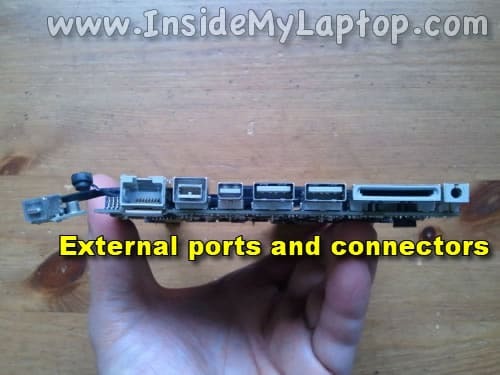 Inspect external ports and connectors on the side of the motherboard. 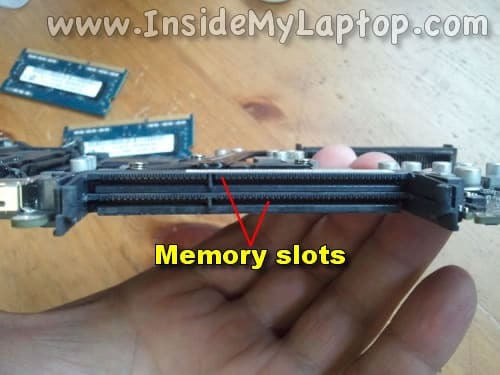 Inspect both memory modules and memory slots. 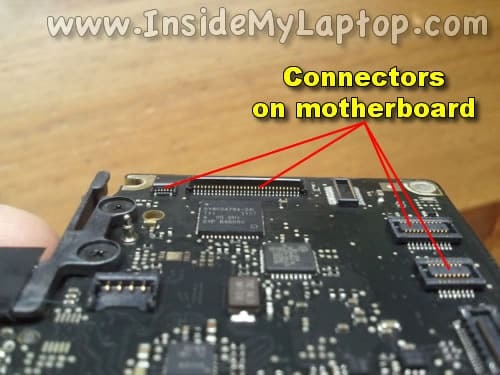 Inspect all connectors on the motherboard. Inspect all cable connectors for liquid damaged. If found, clean it up with the toothbrush and alcohol. Be careful, some cables are thin and easy to rip. After the cleaning is done you will have to wait until the motherboard and other internal components are completely dry. If you used DeoxIT contact cleaner as mentioned in the step 5, it might leave some residue but it’s normal. You can use a hair dryer or air compressor to dry them faster. It is important how to assemble the laptop back together after you cleaned up the liquid damage. You will have to assemble everything back together one step at a time and test after each step. 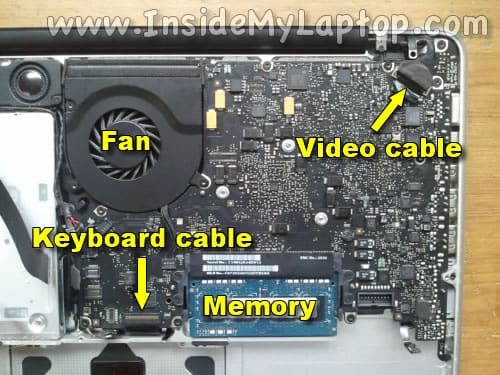 Before installing the motherboard back into the case and connecting anything, plug in the AC adapter into the MagSafe board. The LED on the power plug has to turn on and remain solid green. If the LED lights up, you can jump to the step 12. If the LED doesn’t turn on, try reconnecting the MagSave board to the motherboard and test again. 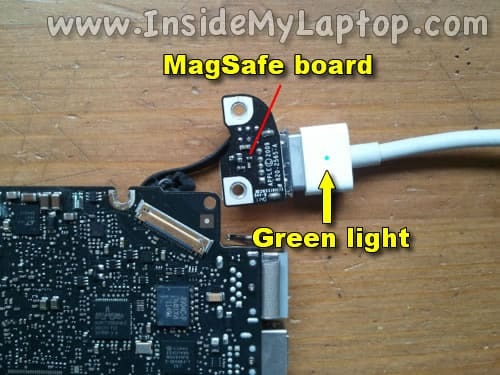 The MagSafe board can be easily unplugged from the motherboard and replaced. You can search for a new replacement MagSafe board using the part number from the original board. If the LED light doesn’t turn on even after replacing the MagSafe board, most likely the motherboard is fried. Just to make sure, take another look at the motherboard. Maybe you missed a spot with liquid damage. You can continue assembling the laptop if the LED light on the AC adapter plug turns on and remains solid green. – Memory (if you removed it earlier). Do not connect any other cables. Plug in the AC adapter and try turning it on as normal. Push on the power button. If the laptop turns on and boots to a white screen with a folder and flashing question mark, it’s a good sign. Turn it off, connect the hard drive and try turning it on again. If the laptop boots properly to the desktop, turn it off and start connecting remaining cables one by one and test after each step. Hopefully, after you connect all remaining cables will run as before. If it doesn’t turn on after step 12, here’s what you can try. 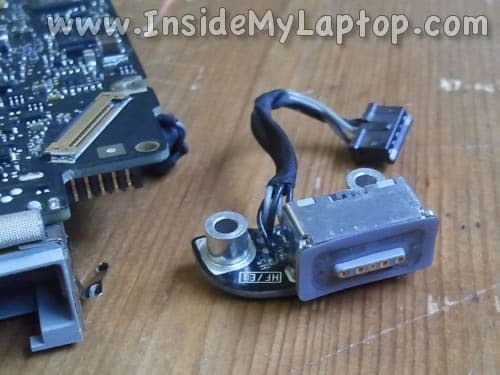 Disconnect the laptop keyboard from the motherboard and try turning it on using the power-on pads. If the laptop turns on via power-on pads (while the keyboard is disconnected) most likely the keyboard was damaged and has to be replaced. 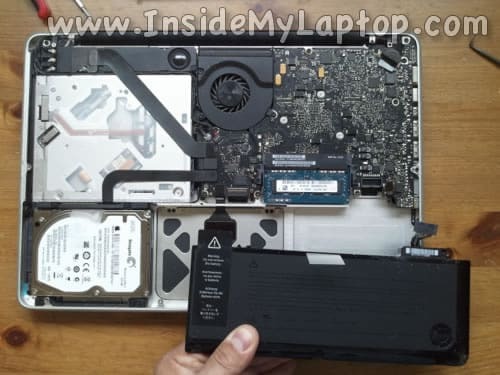 Here’s how to replace failed or damaged keyboard on a MacBook Pro 13″, 15″,17″ unibody . 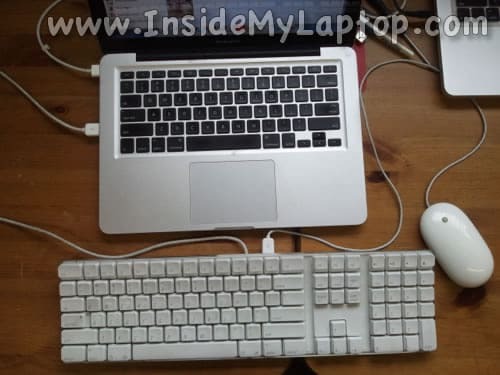 If the laptop starts properly with the internal keyboard disconnected from the motherboard, you can connect all other cables and test it with an external USB keyboard and mouse. If everything works fine with an external keyboard connected but the laptop doesn’t start (or doesn’t work properly) with the internal keyboard connected, it means the internal keyboard failed and has to be replaced. what do you suggest for retina display MBPs? this suggests the battery can not be removed to dry it. You cannot remove the battery but you can remove and clean up the logic board and other internal components. Probably you can use an air compressor to force the liquid from under the battery. 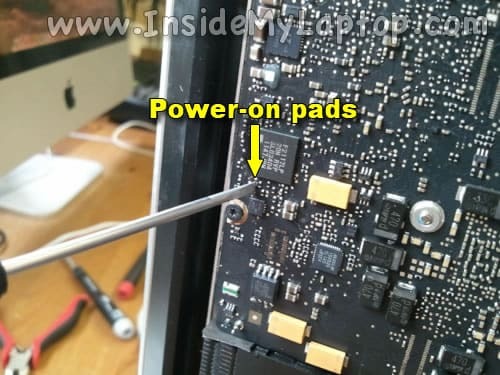 Hi thanks for your guide, I cleaned the motherboard of my macbook pro mid 2010 and and it will only start up using the power pads on the motherboard not the power button. Do you think that a new keyboard/power button would resolve my problem? What would you recommend for someone who spilled water on their HP 2000? Same advice as above or is the process different? You’ll have to take it apart and inspect the motherboard and other internal components for liquid damage. If found, clean it up the same way I did in this guide. Here’s disassembly guide for HP 2000. Hi, the Led lights up solid green, but the laptop does not turn on (even with the power pad – keyboard cable disconnect). What does it mean? Is it anything to do at this point? Did you inspect both sides of the motherboard for liquid damage? Did you find any? I inspected both sides of the motherboard and I found a little bit of corrosion which is, I guess, liquid damage, but nothing serious. I’m wondering if those corrosion spots were really liquid damage. So, I rubbed those spot with a toothbrush and isopropyl alcohol as explained. The problem is that the laptop doesn’t turn on after the step 12 even with the power pad. You said the laptop will not turn on with the keyboard disconnected. Are you trying to turn it on via power-on pads? If it doesn’t turn on via power-on pads, there is a chance the motherboard was damaged. Following your instructions I did mange to get the Macbook to start. It rebooted, very slowly into Safe mode. I haven’t tried an external keyboard yet. But I cannot currently log in as the keyboard is stuck in caps mode and thus the normal password doesn’t work. The battery power is indicated at 94% in upper right of screen, but if I remove the mag safe plug, the mac dies immediately. Can the keyboard be cleaned or serviced? Also whats up with the battery bit? thanks for any insight you might have. I spilled some coke on my keyboard and everythings working fine but some of the keys. Can I replace single keys without removing the whole computer? because I would just buy a new keyboard and install single keys. I followed your procedure step by step however the power button doesn’t turn on the macbook pro & neither does the keyboard work. I cannot type my login password. I disassembled a 2012 MacBook Pro that had liquid damage. I cleaned all traces of liquid damage from the Logic Board w/isopropyl alcohol and reseated the processor with fresh thermal paste. The green light will stay on when the MagSafe adapter is plugged in. However, the unit will not fully power on. the fan just spins and slowly increases in speed. No difference when keyboard is unplugged or when trying to power on via power-on pads. Not sure what to do next. Any help would be greatly appreciated. Thank you! This was extremely helpful. Got my dead, waterlogged macbook pro working 100% after about 90 minutes of work and $ 15.00 purchase of a set of Torx screwdrivers. I actually managed to get my MacBook Pro working again after a spill by drying it as well as possible then connecting an external keyboard and mouse, because the keyboard won’t work now. My laptop kept going into what seemed like sleep mode (black screen) if left idle for about 10 minutes and I had to power on with the power pad to restart it. Today I made the mistake of powering on when I thought it had shut down – heard a zap – and now can’t start it from the power on button at all. Have I completely ruined my MacBook? I removed the bottom cover and had a look – no obvious damage, and only a very small trace of dried liquid near one end of the cover. I’ve tried several times to get the “ifixit” website. Is it down, or is it just me? I just tested it. Works from my location. Try again. Great guide! Managed to fix it after I had cleaned my keyboard lol. Thank you! Today I made the mistake of powering on when I thought it had shut down – heard a zap – and now can’t start it from the power on button at all. Have I completely ruined my MacBook? It’s hard to tell. It’s possible it’s just the keyboard/power button related problem. Disconnect the internal keyboard from the motherboard and try turning it on via power-on pads. Re: not being able to get the ifixit.com website – It may be my IE version. I’m trying to resurrect my older desktop PC (running Windows XP which I’ve discovered is no longer supported) while I work on my MacBook Pro problem. I have to add RAM, then update the OS and IE on the desktop, then will try again. If you think this is a browser related problem, just download Firefox or Chrome. My keyboard went dead, so I’ve shortcut the powerpads, to power on the laptop so I could work with an external keyboard. After replacing the keyboard with a brand new one, the macbook won’t charge anymore. It still works with and without the powersupply, it just won’t charge the battery. I’ve already done a SMC and PRAM reset. Could you please help me out with this one? Would a replacement of the magsafe board help? After replacing the keyboard with a brand new one, the macbook won’t charge anymore. Make sure the MagSafe board plugged in correctly. Try reconnecting the cable. If this doesn’t help, try replacing the MagSafe board. Water spilled into my MacBook Pro keyboard about 6 months ago (I wish I had found this site back then). Everything seems to work with an external keyboard and mouse plugged into the USB ports. If I try using the laptop keyboard it just produces special characters (but nothing different is selected in the keyboard viewer). The touch pad makes the mouse jump around the screen.I was wondering if I should try to clean everything as described on this page at this point. Or if the keyboard itself needs to be replaced or maybe the upper case assembly needs to be replaced. I have a MacBook Pro (non-retina) 2012. Everything seems to work with an external keyboard and mouse . If I try using the laptop keyboard it just produces special characters. The touch pad makes the mouse jump around the screen. It sounds like you’ll have to replace the keyboard and trackpad. After spillage only a few keys don’t work. Do I have to replace whole keyboard? You cannot fix individual keys. If some of them failed you’ll have to replace the keyboard. Hi. So I was sick (long story, very drunken night lol) on my MacBook and now my USB ports and thunderbolt ports are not working. I receive the error stating that a USB device is using too much power even when none are plugged in. I removed the back and noticed mould like on the logic board beside the ports. I cleaned it but still no good. Gonna try remove the logic board as I suspect there will be some underneath aswel. The MagSafe is still working so hoping this will fix it! Hi, my mac was cleaned using petrol it switched on perfectly but some buttons on the key pad are not functioning, what can i do? After a thoroughly cleaning my 2011 MBP started up just fine. I connected my external apple 27″ display and I was good to go. I was able to watch movies from bed, shut down, restart and sleep exactly as before. About a week later, laptop was working just fine then I heard a weird buzz and saw my external monitor get weird zig zag lines so I disconnected it. Laptop still was displaying properly. I rebooted and ran tech tools to check the hardware and ram. No issues. Restarted fine, reconnected the external monitor. Again problems so I disconnected, shut down and rebooted. I get to the login screen, select user and enter my password. Continues to startup, but the black progress bar gets about 1/3 of the way then goes to a white screen. I also noticed my user login icons have faint horizontal lines going across. Could this be my graphic card? I read 2011 mbp had problems with the graphic cards or is this related to spill? I tried resetting pram, starting in safeboot, starting from backup recovery drive without any luck. I’m running Yosemite. Any ideas on what to try? Could this be my graphic card? I read 2011 mbp had problems with the graphic cards or is this related to spill? There is no way I can tell in this case. Did you clean up the motherboard on both sides? If not, maybe the other side still has some liquid damage on it. Try cleaning it up. First off, thank you for this helpful guide. I had water spilled into a mid 2009 MBP15. I removed and thoroughly cleaned the logic board and connectors but it still won’t power on (tried jumping 5th keyboard pin also). I do, however, now get indication that the battery is charging, unlike previously. Is there anything else to try other than replacing the logic board? Thanks! I followed the guide and cleaned the logic board as this is the where I was having the problems but still having trouble yet. My 2 USB ports, thunderbolt port & SD card slot won’t work, but the rest does (headphone jack, FireWire magsafe). Any other ideas on what I could do to get these working? I’m still under warranty also but I know apple won’t cover liquid damage, but thinking If I can clean all liquid/corrosion signs and the liquid sensors haven’t been affected I might be able to get away with it? My 2 USB ports, thunderbolt port & SD card slot won’t work, but the rest does (headphone jack, FireWire magsafe). Any other ideas on what I could do to get these working? Apparently, the logic board has been damaged. Sorry, I cannot help here. I don’t fix logic board on component level. I might be able to get away with it? You can try playing dumb. 🙂 They will not eat you alive. In the worst case you’ll get it back unfixed. Let me know how it goes. Thanks for the detailed repair guide. I cleaned up my macbook as instructed and it powered on without the hard rive connected in step 13, but once I connected the rest of the cable and powered on my macbook and it automatically started to boot in safe mode and that too unsuccessfully. The progress bar would take ages to fill up and when it did the macbook would just shut down. I thought it might be because of faulty keyboard, so i tried to boot using external keyboard and mouse and disconnecting the internal keyboard and trackpad and I still have the same problem. I would disconnect any power and let the motherboard dry for a while. If it was recent liquid spill, it’s still possible some components are still wet. Also, take a closer look at the cable connectors. Make sure there is no corrosion on the contacts. Hi I just spilled liquid on my macbook pro and feel like my world just ended I was in the middle of writing a paper! Well stupid me wasn’t aware to not try to turn it on…and after trying to dry it with a blower I tried to power it on and it won’t turn on..I slightly heard it run a little but then nothing. When I try connecting the charger to it..the charger light is on as if its charging the laptop. Do you think I can still bring it back to life? Do you think I can still bring it back to life? It depends on the damage but if you act quickly there is a chance to bring it back to life. 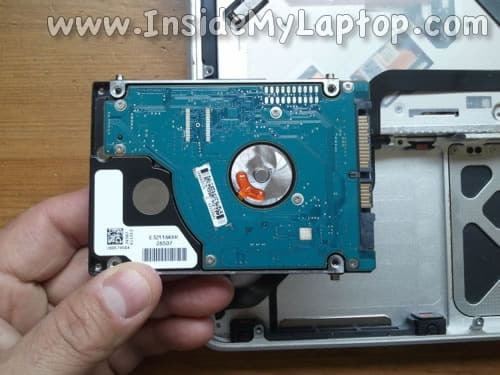 First of all, remove the bottom cover and disconnect the battery. Do not try to turn it on. Try to clean up the liquid spill as I explained in the guide. Let it dry after the cleanup. In step 10, when I’m assembling it back together, I connect the AC power to the MagSafe board by itself and I get no green light. But when I connect the MagSafe board to the motherboard I do get a green light. The green light is kind of light or faint though. Am I supposed to get a green light when just connected to MagSafe board by itself? I don’t get a green a green light when I have AC power connected to MagSafe board by itself. Does this mean the MagSafe board is out? Because I do get a faint green light while MagSafe board and motherboard are both connected? Thanks in advance for any help. Ii have a new maxbook air, last night my dog ran into my table and tipped the table causing the macbook to fall off and a vase full of water to spill mostly on it. It was on when this happened. I did not realize it because it was in sleep mode and a few minutes later as i was drying it The screen started flashing so i turned it off immediately. This morning i tried to turn it on and it does not work, but when hooked up the light turns green, then amber. Do you think it still has a chance to be fixed? I have a 2012 13″ MBP (non retina) that had water spilled on the counter that pooled around it and some seeped into the bottom (don’t ask how). I have taken it apart, cleaned it with alcohol, baked it to ensure it is dry and now almost everything works. The odd thing is that the keyboard and trackpad will work during system boot to, say, reset PRAM or boot into safe mode or select any other combination; however, when the system boots into the OS (or recovery mode, etc) the keyboard and trackpad stop working all together. I can connect an external mouse and keyboard and it works fine…I installed a fresh HDD with a fresh copy of Yosemite and still have the same symptoms. I doubt it’s a hardware related issue since they both work on startup, but for the life of me I can’t locate the issue that prevents them from working. I have turned off BT, reset PRAM and SMC, reset by holding power button in for a long time after shut down, all with the same results. What’s interesting is if I keep pressing caps lock while the system is booting (press once per second) the keyboard and mouse will work after boot, but then stop after a minute…which is some progress I guess. I am going to try and reinstall the OS one more time and see if that makes a difference….I have reached the end of google and am out of ideas….anyone have any thoughts they would like to share? I may also make an appt with the apple store and see if the geniuses can get me pointed in the right direction (or they may just say replace the logic board). Forgot to mention that I have also replaced the “top case” (new trackpad/keyboard), and still have the issue. 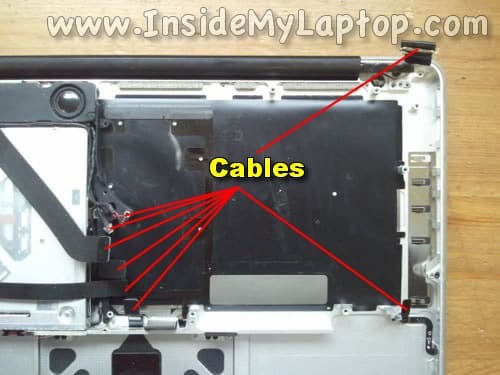 Delawdude – maybe too obvious but did you try re-seating the keyboard ribbon cable and ensure that the latch is down?i think There is a little latch that snaps/ folds down to make a good connection on the ribbon cable. Same with the backlight ribbon cable. Although I have a 2010 MBP. My son got his 2011 MBP wet about 4 months ago. It never turned back on. Took to Apple store and they wanted to send it off but I had to remove a hard drive to put it back to spec. Long story short with the holidays it got put on the back burner and is in a closet. If I follow your guide above is it still possible I might be able to get it working? I just wanted to type to say “thank you” for your advice and help here. I went from expensive, dead brick of a macbook pro to fully functioning within a week. My liquid damage was from hot tea with milk and sugar – not a ton of liquid or damage to the circuit board, but the treatment of rubbing alcohol to treat the damaged spots seemed to be the trick that pushed the laptop from almost dead to fully revived. I am truly grateful! I have a macbook that has juice/liquid spilled on it over a year ago and i found this article today. Any chance it can still be salvaged using these methods? It depends on the damage but worth trying anyway. You have nothing to lose. It’s possible only the keyboard was damaged. Hi! This guide was great! I spilled beer onto my keyboard and near the screen of my 13inch pro. I immediately powered off and let dry. Took apart laptop and cleaned with ethyl alcohol to the best of my ability. Cannot lift motherboard without correct tools and am planning to do so this weekend. As of now, my laptop starts and functions fine however the computer has been consistently asking me if I want to restart with an error that reads something like: Are you sure you want to power down? If I hit cancel enough times it goes away for a bit then pop backs up. This is extremely frustrating. Do you think it could be my logic board? Think all hope is lost? I spilled coffee on my 2011 MacPro the other day and it shut off on me. I got all of the coffee out and cleaned the inside; allowing it to dry for more than a week. I replaced the keyboard (and the associated backlight) as well as the RAM. The disk drive and hard drive were unaffected. Mostly, it is working fine with a few exceptions. (1) certain keys on the keyboard aren’t working, delete, 2 of the arrows, caps lock, etc. (2) I get the “no hardware” error when I attempt to connect to wireless internet. Are there any solutions I could try to fix my keyboard and internet problems? I bought the replacement keyboard from a reliable online source and it arrived in immaculate condition. Hi, thanks for this guide. A 2-yr old spilled water on my mid-2012, 13″ MBP. I followed your cleaning/ drying instructions. I examined the logic board with a magnifying glass and polished it with iso-propryl and small amounts of contact cleaner. When it came time to test the logic-board it would only start after several tries using the Power-On Pad method (step14), and the screen appeared with the question mark. So then I attached my boot up drive, attached the touchpad cable and reattached the keyboard cable deeper than I was able to during my first attempt. I was excited to find that it started right using the “on” button. My desktop appeared and I opened a program. But it suddenly shut off after a minute. Now I cannot seem to get it to start using the on button or the Power-on pad method. It shut off before I was able to try typing. Thoughts? 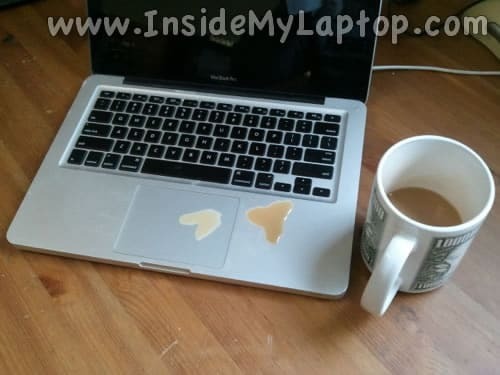 Hi, I spilt water on my Macbook Air and it won’t turn on. What do you suggest other than these steps because, to be honest, if I ever tried doing these steps, I would probably ruin my computer more. If it was a recent water spill you can unplug the battery and let it dry for a few days with the removed bottom cover. But it suddenly shut off after a minute. Now I cannot seem to get it to start using the on button or the Power-on pad method. It shut off before I was able to try typing. Thoughts? I would disconnect the battery and let the logic board to dry for a day or two. It’s possible you still have some water under components. You can use an air compressor to blow off the logic board. I’ve seen it happening exactly as you described before. Hopefully, after the logic board is completely dry it will start again. hi there.. how about if my MacBook is working fine..except for the keyboard and the usb port.. so using an external keyboard is a pain also,.. sometimes the usb port is working..but most of the time its not.. by the way I haven’t tried to open it yet..so this is a good sign right? meaning I might be able to get it work.. I mean the usb port and the keyboard? kindly advise please..thanks a lot.. 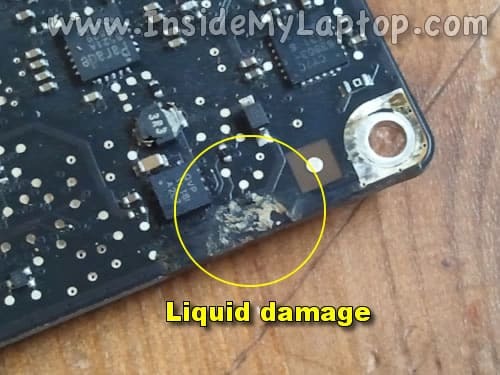 I have a MacBook Pro from mid 2009, I have read up on your articles pertaining to liquid damage and I am thankful for how much information is on your site. I have broken down my MBP to inspectf for visible liquid damage and was able to save just about every thing except the key board and I don’t know what else. My power button did not work but to my surprise, when I connected the charging cable to the MBP it booted but it was unable to charge even though the side charge indicator states “full charge” so I’m lost….Might it be a battery issue ? Also I actually shut down the MBP now obviously won’t turn on. So if I’m correct based on your expertise and articles I need to replace the keyboard / power button and I’m assuming the battery or charging dock. Please help. Thanks. P.S. the MBP charge indicator states “full charge” connected or disconnected from the charging cable. I spilled orange juice on my MacBook Pro a few days ago. I immediately flipped it and cleaned up as much of the mess as I could with paper towels. After that, I put it in front of a fan for several hours and then proceeded to take it apart. I removed all of the components and did not find any liquid damage or corrosion. When I plugged the MagSafe charger into the logic board, the green light turned on and remained solid, but the power button did not turn the computer on. I tried to find the power pads to force start the computer, but could not do it on my model. I assumed, at this point, that the keyboard must have been fried, so I bought a new one and tried again to start the computer with only the keyboard, fan, and video cable plugged into the logic board. Again, nothing happened. What should I do? 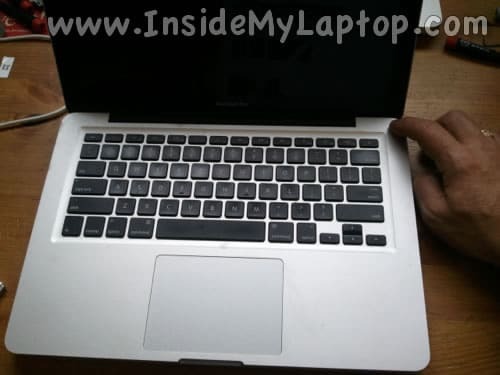 hi i have macbook pro 13″ n it was not turning and i opened and cleaned it. now its switching on with keyboard but not showing any display or even no sound like os boot sound. I went through these steps, and the light on the charger stays green, but I cannot turn it on via the keyboard. I tried shorting it from the 5th to 29th pins and the green light would go off when i did that while the battery is unplugged but if the battery is plugged in there is a ticking that stops when i short those. Regardless it did not turn on. Any recommendations? daughter learned that water bottle and macbook pro in same bag is a bad idea. I followed the instructions on this page and … the laptop is back!! I felt a little foolish trying this, because everyone told me that it was a waste of time, but in the case of this laptop, it actually worked. THANK YOU!! 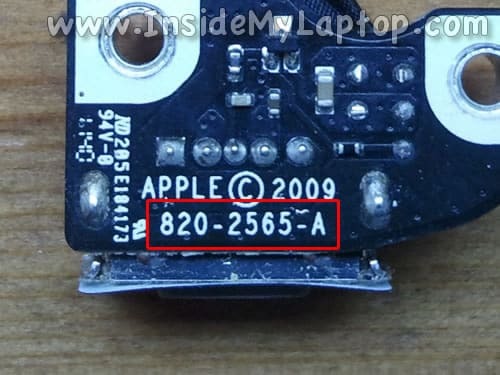 Hi, 2011 macbook pro 13″ ribbon cable for the keyboard will not connect to board connector, is it possible to change the board connector? Hello! Is it possible for you to post a better picture of the power pads? I’m not quite sure which ones to press, thank you!! I repair Mac at component level and it is a good example to prevent serious damage if an electronic got liquid contact. It will work for a while if there is no damage occured to the components. After a while the machine will start to act up as the corrosion build up and the machine totally stop working one day. The answers posted about Retina are not 100% correct. If you know how to work on the machines, the battery on retina macbooks are glued to the case and it can be removed. But there is no way of telling what kind of damage caused to the logic board unless you did proper tests. As a repair guy, I would not want to repair any machine being cleaned and tempered because it become nightmare to trace the place of damage occured and which circuits are effected. I would suggest to disconnect the battery and just soak the board in 99.9% alcohol. Do not use the pharma grade alcohol as it is 70% alcohol and 30% water. Let the repair person handle it but not the self titled repair guys just use a heat gun to destroy the chips and tell you to get a new mother board. Hi I managed to spill milk shake not much and I had a keyboard cover so not much went into that section. I powered it down my self flipped it over so the keyboard was facing down and opened the back and removed the battery connector. I cleaned it up as much as possible and left it near a heater and half hour later I decided to re connect the battery. It comes on battery at 43%. When I connect the charger it show instant charged to 100% and does on stay on switches it self off after a few mins. Any advice what gone is it just a case of replacing the power safe board. I spilled a full mug of coffee with cream onto my MacBook’s keyboard yesterday and the screen went black before I even turned it over. After slapping myself and cursing loudly for a few minutes I removed the cover and gently mopped up after disconnecting the battery. Without removing any components, I slowly poured an entire bottle of isopropyl alcohol directly onto the exposed circuitry and some onto the keyboard, then propped it up to drain with a fan blowing onto it overnight. This morning it started and seems to be working fine. I’m sure it would have been worse had I used sugar in my coffee. My mug now sits on a small side table. I had called a local tech and he estimated $900 to repair the “fried circuitry”. The alcohol costs $3!! I have followed the instruction, the LED lights up, the battery lights has response, but even short the power pad or press the start button, the board has no response. any idea? My macbook air continues to auto restart at times and audio sometimes get distorted then goes back to being ok, what may be the issue? My mbp had bleach spilled directly onto the keyboard. Turned it off for a couple days, dried it with a blow dryer. It turned on, worked fine for an hour then shut off. Now it shows a faint green led on the power light but won’t turn on. I haven’t even looked at it now for six months. Am I Sol?